We’re just a few short weeks away from our lambing window, but I’m already keeping an eye on the ewes’ udders and hoo-has. 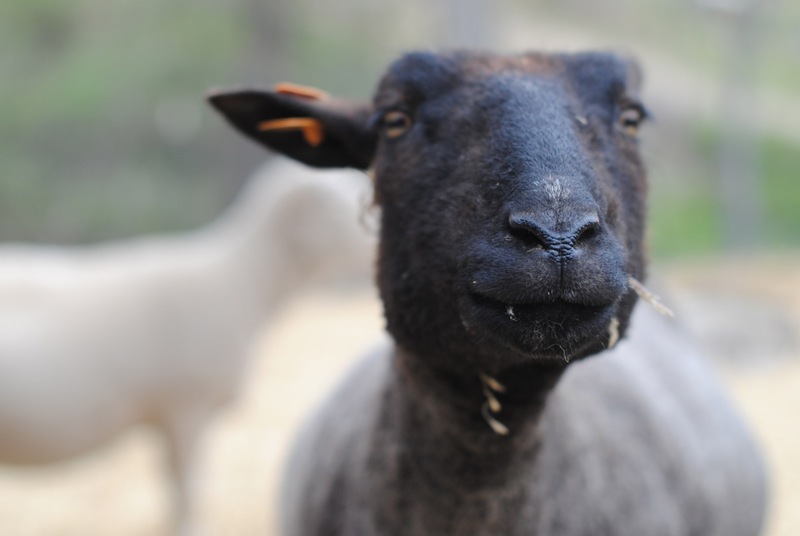 There shouldn’t be anyone lambing earlier than May 4, but I feel most comfortable when I can get a really good feel for how everyone looks and how they are acting leading up to the event. This helps better notice subtle changes that occur so I know when I should be out every two hours and when I can get some sleep. Of course, Susan and I have been plenty surprised by sheep and goats alike that show zero sign of impending labor and then are nursing their babes next time we check them! 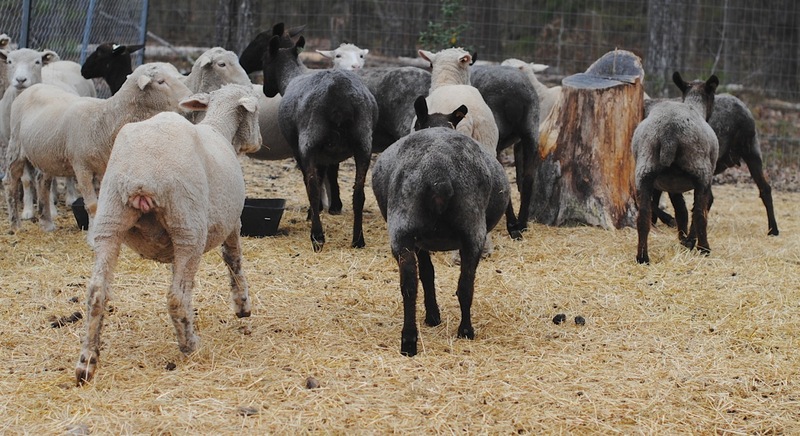 Right now udders and teats are easy to see since the ladies have been sheared, and though there’s no significant “bagging up” of their udders, they are becoming just the slightest big bigger every day. They are getting wider and wider every day, too! Occasionally just after feeding time I can sit with Piper and rest my head or hands on her belly and feel a little kicking in there. 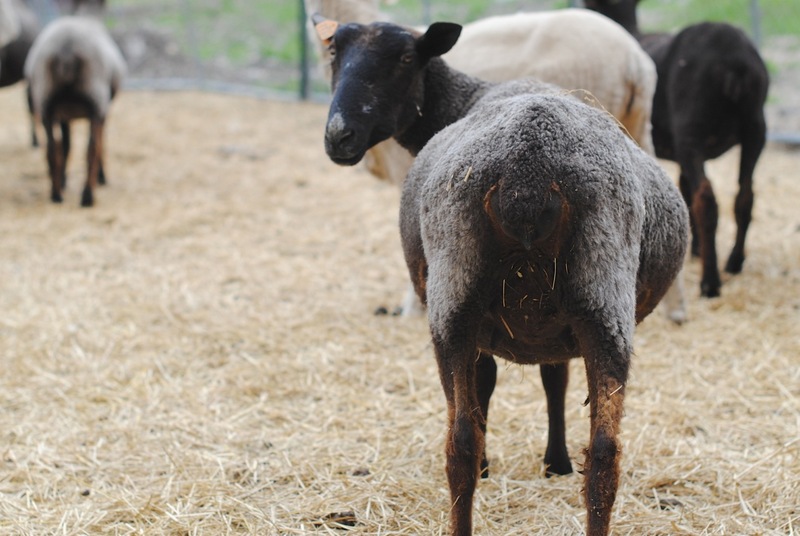 Wren’s udder hasn’t enlarged very much, but her teats have been getting fatter and more pronounced. This lady has been looking wide, but there’s not much udder or teat development. This could mean that either she was bred a lot later than some of the others, or it could just be that she won’t bag up at all until she lambs. Sometimes they do that. Just like any other mammal, no two sheep are alike, no two pregnancies are alike, no two lambings are alike. Some get all dramatic, some are quiet and reserved. Some bag up huge way ahead of time, others never bag up at all. There is one way they are all alike, however. They don’t like me checking out their backsides. They are very suspicious of this activity, and will quickly turn and sniff at my face (or camera). It’s going to be an interesting mix of lambs this year: our ram was a white Border Leicester. Some of the ewes are colored Border Leicester. Some of the ewes are white Cormo. And yet other ewes are a mix of Cormo and Southdown. I can’t wait to see how the babies turn out! As for lambcam (which I know everyone is waiting for!) we are waiting on some new equipment, but it will absolutely be working before the lambs come. We’ll let y’all know when it’s back up.